Even good teams have their weak spots, but really good teams figure out a way to exercise damage control. The following four clubs, all projected to be in the 2012 playoff hunt, could each be sunk by some serious bombs on their Opening Day rosters. Below is a look at how they got into this mess and what they might do to stop the bleeding. Another year, another Chase Utley knee injury. This time he’s sidelined by chondromalacia, an ailment that sounds straight out of a James Cameron flick. At this point, the plan is to miss the first couple weeks of the season and continue rehabbing those sore knees, but the possibility of microfracture surgery — which could sideline Utley for several months — looms large. Utley is in his 30s, and his MVP-caliber days might be behind him, but he registered 3.9 WAR last season (seventh among all second basemen) despite missing 59 games. Without him, the Phillies’ fallback options will struggle to even reach half that production — unless Charlie Manuel figures out a way to piece them together, Frankenstein-style. Freddy Galvis has one of the best young middle infield gloves in the game but bats with a toothpick. Michael Martinez is a good utility man but would be exposed as a regular, not to mention he just fractured his right foot. With few viable second basemen left, the Phillies are likely left addressing the position internally and praying for one of those magical German doctors athletes are seeing these days. 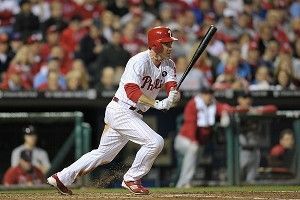 While Utley’s knee injury last year barely tripped up the Phillies on their way to 102 wins, the NL East looks to be awfully competitive in 2012, as you might have heard. Even with an optimistic 428 plate appearances pegged for Utley, PECOTA projects the Phillies to win 88 games, tying the Braves and putting them just one game ahead of the made-over Marlins. For the first time in a while, September could be a real nail-biter for Phillies fans — PECOTA projects a lot of cheesesteaks angrily thrown at television screens. Maybe this is nitpicky, but the Red Sox play in the toughest division in sports and did just blow a nine-game lead last September in large part because of a lack of pitching depth. Unless someone opens a combination KFC-GameStop on Lansdowne Street, things probably can’t get worse for Sox starters in 2012, but once again, the back of the rotation is shaky. Felix Doubront and Daniel Bard “won” the final two rotation spots, but with Andrew Bailey’s thumb troubles, Bobby Valentine could be quick to ship Bard back to the bullpen, his natural habitat. Despite making some serviceable spot starts last year and logging more than 100 innings, Alfredo Aceves failed to get the nod as a starter. However, Josh Beckett’s currently seeing a thumb specialist in Cleveland (yes, another thumb injury. It’s like the Sox want this beer, chicken, and video game gag to never end), and Clay Buchholz has yet to plan his annual rash of injuries, so it wouldn’t be hard to see Aceves in the no. 2 slot by, say, July. If, in fact, Sox starters do begin falling like dominoes, Boston will be left to pick its poison between Aaron Cook, Ross Ohlendorf, and Vicente Padilla. Maybe one of these misfit toys will surprise and be this year’s Bartolo Colon, but I can’t imagine New Englanders sleeping soundly at night with that strategy in place. This offseason, the Yankees, Angels, and Rangers all made big additions to their rotations while the Sox pinched pennies and passed on Roy Oswalt and Edwin Jackson. Boston’s offense might score more runs than most teams could hitting off a tee, but the same could be true for the aforementioned AL heavyweights. If Boston’s dollar bin hurlers start getting shelled two out of every five games, expect GM Ben Cherington to keep up with the Joneses and deal for a reliable starter. The Rockies are a tough team to read and aren’t exactly sure-fire contenders, but most projections see them hanging with Arizona and San Francisco in a close NL West race. After last year’s debacle at third — which saw Ian Stewart, Ty Wigginton, Jose Lopez, and Kevin Kouzmanoff combine for below-replacement-level production — Colorado put a Band-Aid on the gaping flesh wound by signing Casey Blake. Then they decided they’d rather go with the gaping flesh wound by releasing Blake and going with the very unproven tag team of Chris Nelson and Jordan Pacheco at third. Nelson and Pacheco have combined for just 304 major league plate appearances, neither have ever hit incredibly well at the upper minor league levels, and Pacheco’s a recently converted catcher who’s still learning. The hope here is that top prospect Nolan Arenado plows through Double-A and Triple-A in time to give the Rockies a boost in the playoff race. That could be a costly game of chicken for Colorado, at least in 2012. While many see Arenado as a future All-Star at third, he’s yet to play a game above high-A and may not be ready for the majors until September. None of this is to suggest that Casey Blake would’ve delivered the Rockies to the promised land — after all, he is 38 and coming off a 2011 season that was barely above replacement level. Still, the Rockies risk another mess at third. Should Arenado stall early in the season, don’t be surprised to see Colorado shop around for a cheap veteran stopgap. The Yunel Escobar/Alex Gonzalez deal continues to haunt the Braves. While Escobar has turned into a valuable bargain for the Blue Jays, the Braves are left throwing two unproven 22-year-olds into the Opening Day lineup and hoping one sticks. Tyler Pastornicky, who arrived as part of the deal for Escobar, had a strong Double-A season last year but played only 27 games at Triple-A and has no experience in the majors. He was the favorite heading into spring training, was almost passed over in favor of Andrelton Simmons, a slick defender who hasn’t played a single game above high-A, then ultimately won the job. Well, for now at least. While both prospects rate as future everyday players, they could easily flop in 2012, even if used in a platoon scenario. The Braves also have aging defensive wizard Jack Wilson as insurance, though defensive metrics don’t find Wilson’s recent glove work as wizardly as it once was, and the veteran shortstop has battled injuries all spring. Like the Phillies, the Braves have to make it through the Octagon that is the NL East if they hope to reach the playoffs. Should they start bleeding wins at shortstop, they could tap their starting pitching depth for some help. However, Tim Hudson will likely miss the first month of the season, prospect Arodys Vizcaino will miss all of 2012, and Jair Jurrjens failed to woo suitors when the Braves shopped him this offseason. But hey, I’m sure everyone will be lining up to trade for Hungry Hungry Hippos-caliber innings eater Livan Hernandez. All this pitching uncertainty might force Atlanta to roll the dice at shortstop, at least until their rotation depth is restored.